Here’s what Will Flannigan, 26, would rather do with the $401.58 he pays on his student loans every month. • Buy a house: the mortgage payment on a house he looked at was the same as his rent, but renovating or fixing anything would be unaffordable. • Buy new clothes – thrift shops are standard. • Eat dinner out at someplace other than a fast food restaurant. 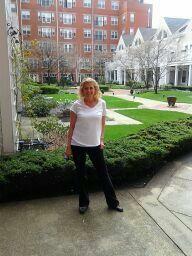 Flannigan is getting married in August – to a woman who pays about $250 per month for her college loans. 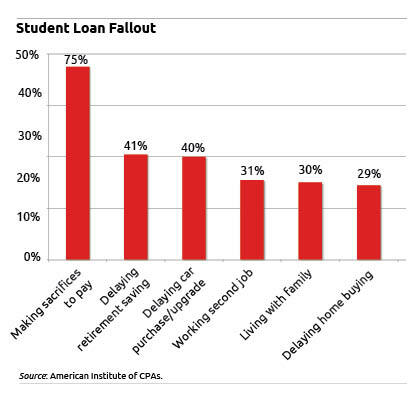 Three out of four people now paying off student debt – whether graduates or their parents – are just like Flannigan: they’re delaying important life goals in order to make their payments, according to a new survey by Harris Interactive sponsored by the American Institute of CPAs (AICPA). About 40 percent also said they have delayed saving for retirement or buying a car, to name just two deferred goals. This survey, which was random and based on telephone interviews, illustrates the reason behind the growing concern among financial advisers, 20- and 30-somethings, and their parents that paying for a college education has become a burden with financial implications for years, even decades. It is extremely difficult for black Americans to accumulate wealth they can pass on to their children. Getting to the heart of this concern is new research by the Urban Institute. 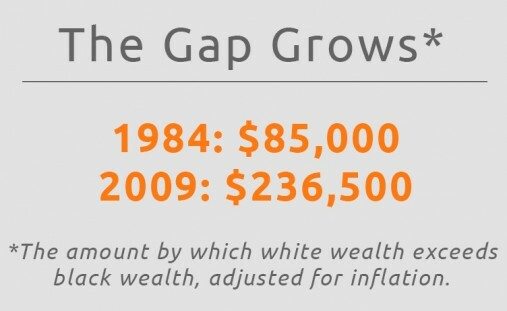 The Washington think tank found that while blacks excel at converting the gifts and inheritances they receive into even more wealth, the size and frequency of these bequests are much smaller than for whites, perpetuating a wealth gap that has existed since emancipation. “In the news, you hear about the racial income gap, but the racial wealth gap is so much larger, and it’s not improving,” said Signe-Mary McKernan, a senior fellow at the Urban Institute and co-author of the new study. Smaller inheritances and gifts in African-American families “are hindering their opportunity and wealth accumulation,” she said, about her findings. 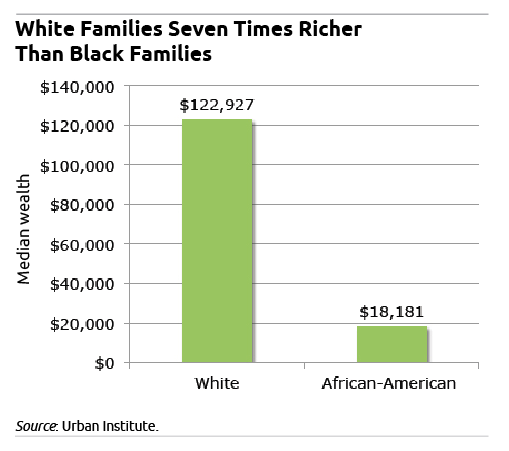 Median wealth for black families is $18,181 – white family wealth is $122,927, and Hispanic wealth is $33,619. But the real question is, why is white wealth seven times larger than black wealth? The researchers found that blacks are five times less likely to receive family bequests than are whites, and their inheritances are $5,013 smaller. McKernan’s research employed standard statistical methods by holding factors such as income and education constant in order to highlight the racial aspect of differences in wealth. Americans with college degrees are more likely to overuse their credit cards, home equity loans and other debts than are people who didn’t attend college, according to research in the latest International Journal of Consumer Studies. “I was really expecting the reverse,” Sherman Hanna, a professor of consumer sciences at Ohio State University in Columbus, said about the results of his research, conducted in conjunction with Ewha Womans University in Seoul and the University of Georgia in Athens. The study also reveals the increasing fragility of Americans’ finances, particularly in the run-up to the 2008 financial crisis when overall debt levels surged amid what Hanna called a “democratization of credit” that made it easier – critics said too easy – to borrow. 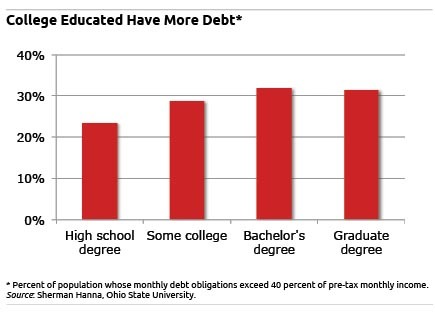 Based on education levels, Americans with a bachelor’s or graduate degree had more than a 32 percent likelihood of being heavily in debt. That compared with 24.5 percent for people who graduated from high school and did not attend college, according to the study, which tracked U.S. households from 1992 through 2007. To make their comparison, the researchers controlled for the effect of incomes.